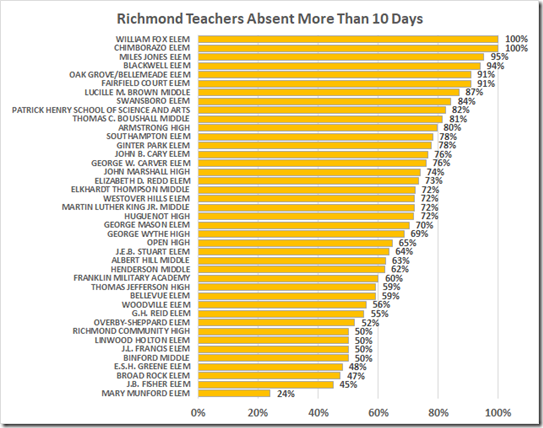 If you thought Richmond’s absence rate (24% of students absent 15 days or more in 2016) was bad, wait until you see the teachers’ absence rate. 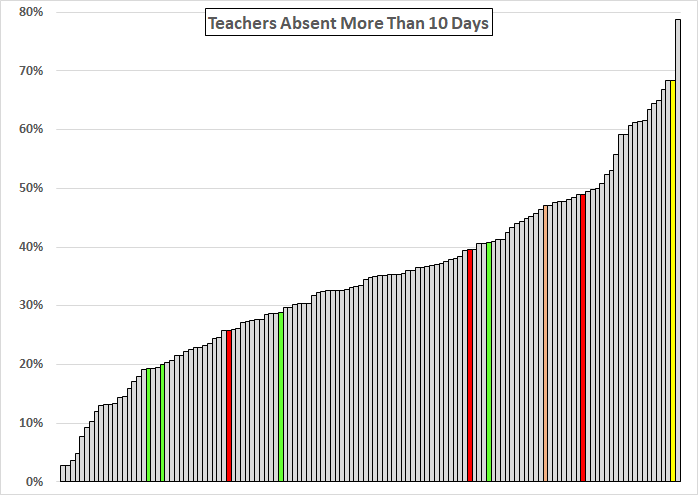 The Feds’ 2016 Civil Rights Data Collection includes data on the numbers of teachers absent from work more than ten days. 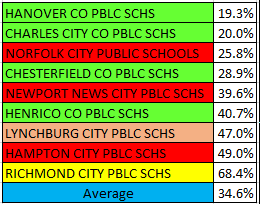 Here are Virginia’s division data, sorted by increasing rates. The 68.4% Richmond rate (second from worst) for 2016 deteriorated from 56% (ninth from worst) in 2014. 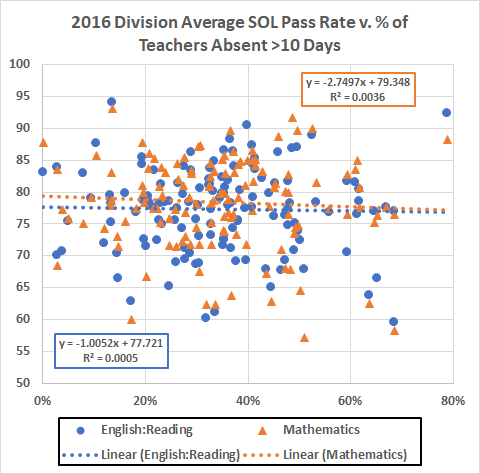 The 2016 division mean is 34.6% with a standard deviation of 15.6%. That puts Richmond 2.2 standard deviations above the mean. 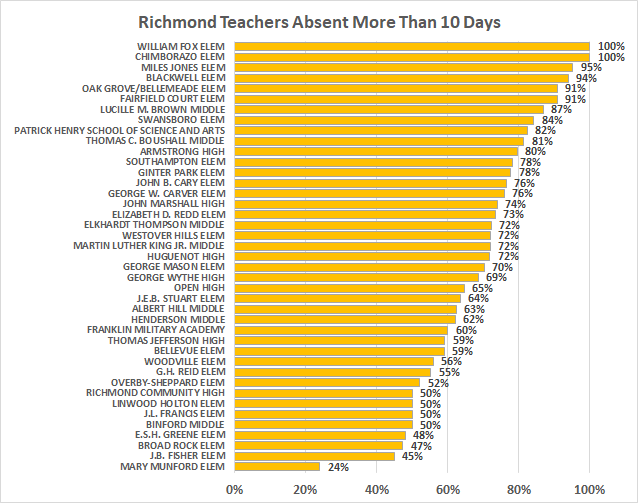 To get this 68.4% average absence rate, some Richmond schools had to have more than 68% of their teachers absent for more than ten days. 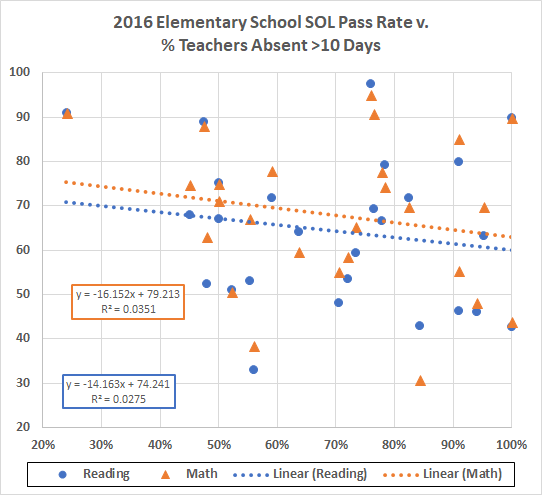 Fox and Chimborazo more than managed that: ALL their teachers were absent more than ten days. Miles Jones only managed 95%. As an interesting contrast, the Maggie Walker rate was 5.6%. For sure, the schools – especially the elementary schools – are nurseries for respiratory diseases. 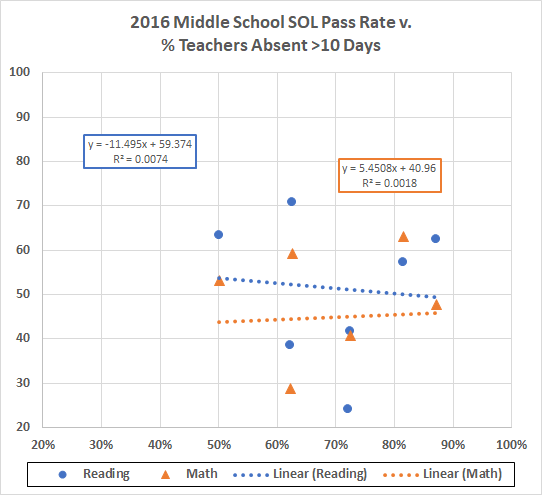 The eleven elementary schools at the bottom of this graph average around 50% (with the notable exception of Munford, at 24%). 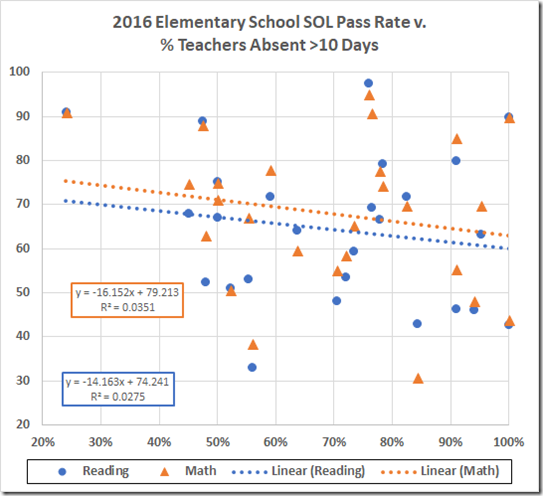 These contrast with the six elementary schools at the top of the graph that average around 95%. 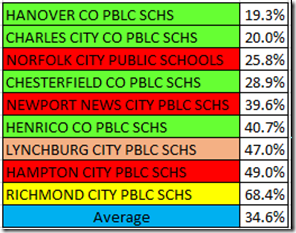 Aside from this strange dichotomy, sick elementary school students cannot explain why every Richmond school except Munford shows a higher rate than the 34% state average, with non-elementary Armstrong High at 80% and Brown Middle at 87%. This shows all the symptoms of an horrendous management failure. 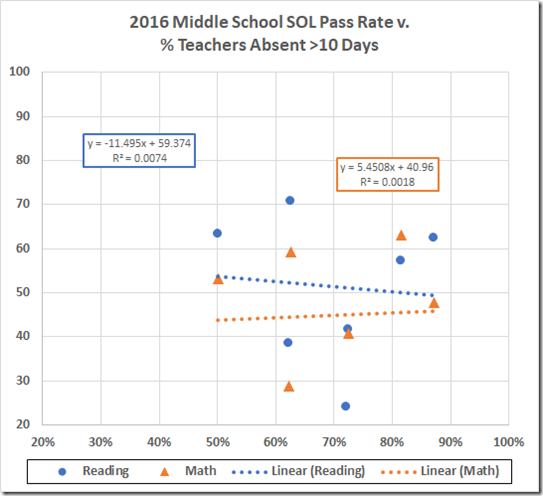 Note: Franklin Military has both middle and high school grades. Lacking a clean way to separate those data, I’ve omitted Franklin from this analysis. 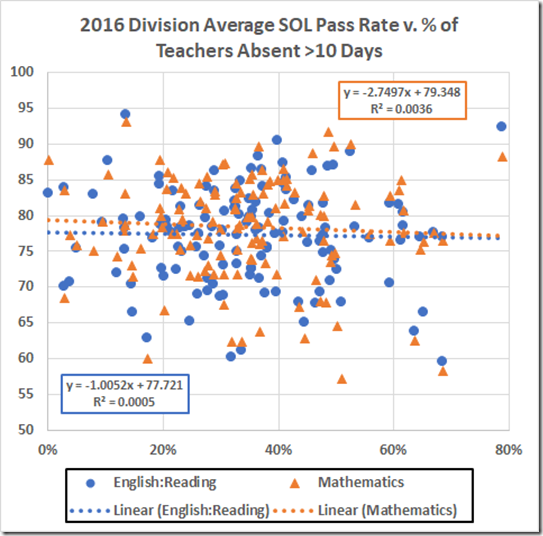 The data by division don’t even hint at any effect of larger teacher absence rates on SOL performance. 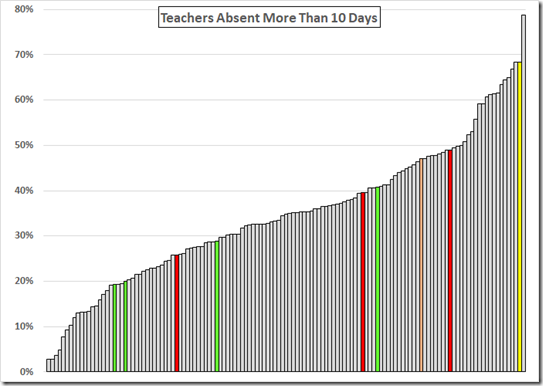 It’s enough to make one suspect that it’s not the effective teachers who are running up all those absences. 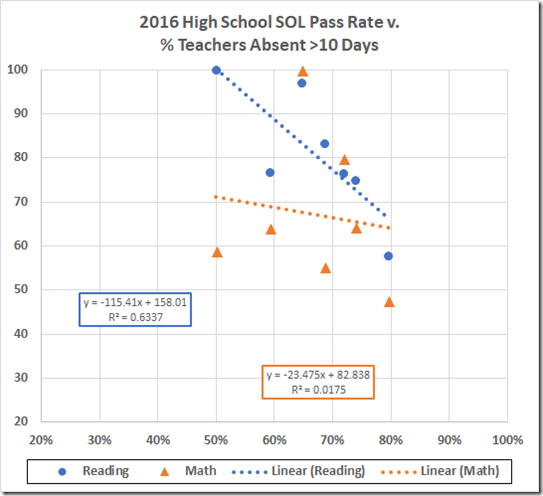 We have another measure of the effect of these teacher absences: The 2016 RPS budget includes $102.9 million for classroom instructional staff and $4.3 million for substitutes. 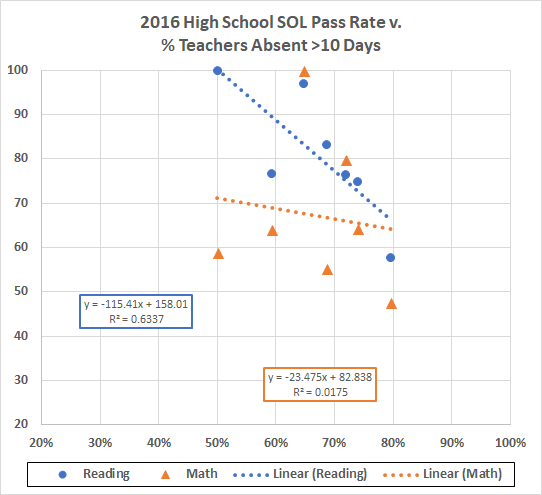 If RPS could cut the teacher absence rate by half (to about the state average), the savings could be used to raise teacher pay by about 2%.